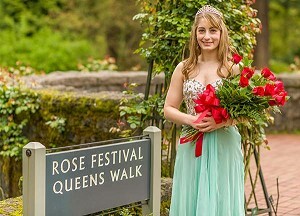 BEAVERTON — June 6 was a day to remember for Clara Cannon, Valley Catholic senior and Portland Rose Festival Metro West Princess. In the morning, she took part in the Rose Festival Queen's Coronation and rode on the Rose Festival Court float in the Portland Grand Floral Parade. In the afternoon, she received her diploma during Valley Catholic High School's commencement. A member of the National Honor Society, Cannon’s high school career included serving as editor of a school newspaper and a member of a speech and debate team. She was also a Valley Catholic swim team state finalist. During May, Rose Festival Court members traveled full-time five days a week for five weeks, visiting community events, business leaders, hospitals, senior living centers, youth organizations and civic groups. Cannon made history as Valley Catholic’s first Rose Festival Princess. Valley Catholic students became eligible to apply in 2015 following the school’s entry into 4A athletics. Cannon will attend the University of Idaho where she plans to study computer engineering then pursue a career as an engineer in the film industry. On June 15, Cannon returned to the Sisters of St. Mary of Oregon campus for a final royal duty: crowning the 2015 Rose Queen at Maryville, home to senior citizens in need of care. Please fill out the form below to submit a comment. Message is a required field. Captcha entry is not valid, please try again. A comment must be approved by our staff before it will displayed on the website.